We are a group of woodland owners educating ourselves, other landowners, and the public through workshops and field events. Using practical examples, landowner experience, and professionals’ expertise, we want to help everyone realize the potential of their woodland. We also hope the public will come to understand the economic and environmental benefits of sustainable forest management. 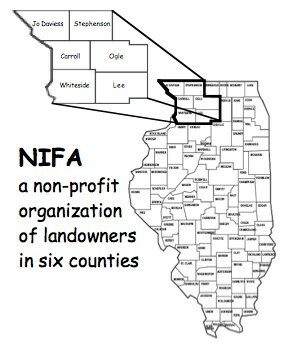 Whether you are a NIFA member or not, we need your help to control threats to our Illinois forests. Please do not move firewood or logs across state or county lines, especially if the bark is still attached. If you have been hiking elsewhere, please brush all seeds and weed debris off your boots and clothes before returning home or visiting NW Illinois. If you have been camping in areas of gypsy moth infestation, please hose off your vehicles and campers before returning to Illinois. Please look over our INVASIVE SPECIES section, so that you can identify these nasty destructive weeds. Helping to control them would be even better. If you are a landowner and hire someone to work on your land, ask them to thoroughly clean and hose off their equipment before bringing it onto your property. Remember that people are mostly responsible for the spread of invasive plants and insects, so anything that you can do to prevent their movement is appreciated. Please pass the word. Thank you. download "Why Should I Care About Invasive Plants?" Is This the Future of DNR Forestry?